"I don’t wear most of it, but I don’t want to just throw it out!" And you shouldn’t! Throwing away clothes can cost your city more than it helps. Donating is always a great option - there are many places ready & willing to accept your used clothing to help out those in need, and we’ll talk about those in a future post. If you are looking to earn some cash back from your clothes, there are a few different options available to you. As a reseller, I’ve learned the ins and outs of some different selling platforms. Some take more time than others to figure out, and that can be a hold up when you just want to get rid of your clothes quickly. I’ve compiled some fast facts & tips into this post in hopes of helping you find what will work best for your closet clean out! In this post, I'll break down the apps & websites you can use to make cash for your clothes without even leaving your home. Read through to find out my personal favorite! You have a lot of “mall brand” items in good condition taking up room in your closet and are not in a huge rush to get some cash back. You simply request a bag to be sent to you from ThredUp’s website. They ship it for free - you fill it with as much as you can, and send it right back to them! They will look through your items to determine if it can be sold. Because of ThredUp’s growing popularity, it is now taking an average of 53 days to process each bag - that means you’ll have to wait a couple months to get cash back. If you choose to pay 9.99 instead of getting the free bag, they will process your bag within a week of receiving it. Once they’ve processed your items and determined their worth, you have three options. You can use the amount as credit to buy clothes on ThredUp, donate the money to a charity, or have it sent directly to your Paypal account. Any clothing that they do not deem acceptable to sell are sent to their recycling partners and used to create new products. Items without defects (no stains, holes, rips, etc.) that are trendy and in-season. They tend to accept more “mall brands” and name brands that are well known. You can use their Payout Estimator to get an idea of how much your items are worth before sending them. You have a little more time on your hands and want to get as much as possible for your items. This is also a great platform if you are selling more than just clothes. After taking photos of the items, you can list them through the website or app. The most confusing thing for most new sellers is figuring out shipping options. When listing, you must specify how the item will be shipped and set a shipping cost for the buyer. Personally, I like to list the item a little higher than I would and just offer free shipping, so the few extra dollars for that will come out of my own pocket and I don’t have to do all the work beforehand. If you’re selling a lot of items, investing in a small shipping scale would be a great idea. You can weigh the items and use eBay’s shipping calculator to estimate the price before listing. You have the choice to set your item up for a “Buy it Now” price or set it as an auction. If you are in a hurry to get things off your hands, I would start with auction. If not, set “Buy it Now” and accept offers from users as well. eBay does a great job of giving recommended prices for items - if they have none, just search the item through eBay and filter for items that have already sold. This will give you an idea of how much it has sold for previously. Once an item is purchased, the buyer will pay through eBay. You can reuse boxes or buy packages of envelopes for smaller items. Print the shipping label through eBay, and you’re good to go! eBay is a great place to sell because of less restrictions. I have even sold a few items that had tiny holes or damages through eBay auctions to get rid of them - just be sure to make it clear in the listing if this is the case. You can list clothing, accessories, and even other unwanted items around your house such as books or old video games. You have more than a few things to get rid of that are popular or trendy brands & styles. This platform is more social than most selling apps, and is also great for someone who wants to sell AND buy (trust me, you’ll be tempted) to keep up a rotating wardrobe. Take photos of your clothes and post them to your “closet” - aka, your selling page within the app. Buyers on Poshmark love to see clear photos showing details of the item, so use as many of the 8 photo spots as you can - photograph the whole item, up close, the brand tag, the inside tags, any blemishes, etc. Set the price a little higher than you would normally ask, because people can offer lower on your item and you can also drop the price yourself later on to trigger discount emails to interested buyers. If someone makes an offer on your item, you are given the choice to counter offer, accept, or decline. Buyers may also add your item to a “bundle” - they usually do this if you have multiple items that they want, so they only have to pay once for shipping. Once they bundle, you can offer them a personal discount as well. (See all these discounts!? That’s why you should always start higher). Once an item sells, Poshmark will create the shipping label for you - no confusion! If you are only selling a few items, you can reuse boxes or buy a few bubble mailer envelopes. If you are planning to sell a good chunk of your closet, go to the USPS website and order Tyvek envelopes or a few Priority Mail boxes (for larger items or bundles) to be delivered to you FOR FREE! Yes, they’re free! Order these ahead of time, though, because they sometimes take a bit to arrive. Make sure you get boxes/envelopes that say Priority Mail only, not flat rate or regional rate. Poshmark sellers love to ship their items like boutique stores - tissue paper, ribbon, and maybe a nice thank you note - but it’s not required. Just make sure the item is protected! Package it up, tape on the shipping label provided by Poshmark, and it’s good to go! Since it’s Priority Mail, you can go to the USPS website and schedule for the item to be picked up at your door the next day. If you want to ship it ASAP or have some time to drive, you can take it to the closest USPS drop box or bring it by the post office to be scanned in. Items that sell well on Poshmark tend to be trendy and name brand, but I have also seen many items sell well that may not fit into that category. Permitted items include men’s, women’s and children’s clothing, accessories such as purses and phone cases, and jewelry. You want to get rid of things quickly and not have to deal with shipping or possibly even driving. There are tons of Facebook groups dedicated specifically to reselling within the community - If you don’t know the name of your local groups, ask around, or simply type your city’s name + “garage sale” or “resell” in the search box. 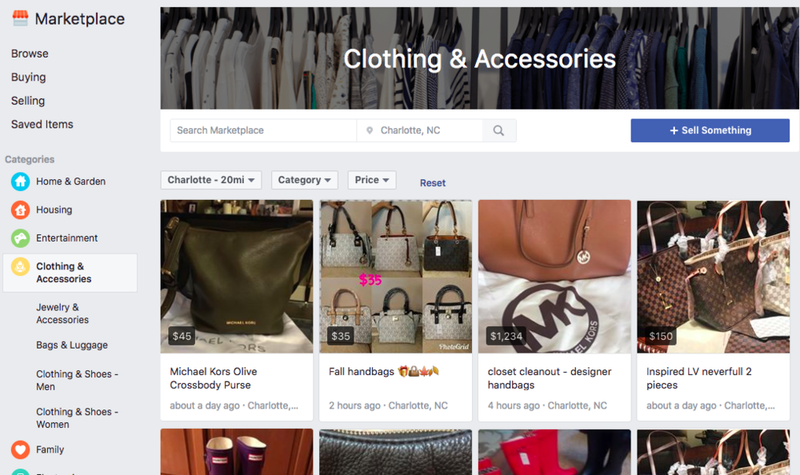 This became so popular that Facebook now has a place specifically for selling locally - Facebook Marketplace. All you need to do is take a picture of your item(s) and post them through the Marketplace. Share any information, how much you are asking, and a general location for pick-up. Once you post to the Marketplace, it will give you the option to also post in those Facebook Groups that allow selling items - this is what we call “cross-posting.” It just makes sure that as many people as possible are seeing your items. You will receive Facebook messages from local users interested in buying from you. The great thing about selling through Facebook is that you can see who the person is before meeting up, and also see if you have any mutual friends! While some people prefer to meet at a local public place, like the parking lot of a mall or grocery store, you can also just have people come pick-up from your porch if you are comfortable with it. When it comes to cleaning out your closet, Facebook is great for whole lots of clothing. Have a whole bag of the same size clothes that you want to get rid of? Just post the entire bag for sale, list the general sizes & brands included, and give an asking price. There are also groups dedicated specifically to moms looking for children’s clothes, so if you have growing little ones, this is a quick & easy way to resell. You have designer items sitting around just because you know they are money sitting in your closet. They will give you a larger commission than most for these luxury items and also accept accessories like handbags and watches. Choose whether you’d like your items to be picked up from your home or if you want to print a free shipping label to send items to them. In-home pickup is only available in some locations, and Charlotte is one of them! If you want to send them yourself, you let them know exactly what you’re sending by searching their accepted brands and selecting what you have. The RealReal authenticates, photographs & lists your item to sell - according to the website, they are able to get this done in about 3 days on average. You receive 55% of the selling price for under $1,500 in sales. Because The RealReal is a luxury consignment seller, they do offer higher commission rates for higher priced luxury items. The expensive stuff. The RealReal is specifically for luxury consignment. This is great for those high-end purses, watches, or clothing items that have been sitting in your closet because they’re worth way too much to let go. If you know me, this likely is not a surprise at all. While all of these apps are great for getting cash for your unused clothes, my go-to is always Poshmark. Poshmark is a very social app and is dedicated to building a community. The more you interact with others through the app, the more likely it is that your things will sell. Follow other users and share some of their items. This will bump their items to the main feed of all of your followers, and most of the time if you share for others, they will share your items to their followers in return. Use clear and simple name titles for your listings. You’ll see other users using emojis to catch attention - don’t do that. The more clear your title, the more likely it is to show up in Google searches. I’ve had many buyers that had brand new Poshmark accounts because they had found the item through Google. Some items may take more time to sell, but I promise the outcome is worth it! If you haven’t used Poshmark yet and want to check it out, make sure to use my code (MINIMIZEDCLOSET) when you sign up to get $5 off of your first purchase through the app! If you’re anything like me, you’ll probably end up using your money from sales to a buy a few things for yourself. Don’t have the time or energy to sell? Reselling is included in all of my hands-on organization packages. I’d love to hear from you - share what apps you love using to sell your unused clothing and accessories! Were there any great ones that I left off of the list? IF YOU'D LIKE TO GET MORE TIPS & UPDATES FROM MINIMIZED CLOSET, SIGN UP FOR OUR EMAIL LIST ON THE HOME PAGE OR FOLLOW ON INSTAGRAM! The hardest part of decluttering is usually finding a place to start. Here are 13 things that you can get rid of today to take a step towards the uncluttered home that you deserve. Grab a bag - or two! One for donations and one for trash. If you’re not at home, you should probably save this article for later, because we’re doing this together. You’ve been wanting to get rid of the “junk” that’s starting to pile up, so we’re getting started - right now! 1. Let’s start with the beauty products. Nobody needs old or unused makeup or nail polish, but we tend to hold onto things “just in case” or because we don’t take the time to clean out. Toss nail polish that were gifts but never used, hair products that have just been sitting in your cabinet, and makeup that has reached its end. 2. It can be hard to let go of clothes that don’t fit. Maybe you outgrew them or maybe they never fit to begin with. Having them in your closet not only takes up space but in some cases can also cause self-doubt and frustration. If this one seems overwhelming and you don’t already have a few pieces that you know don’t fit, grab an empty basket/bag and set it in or near your closet. For the next few weeks, toss in any clothes that don’t fit or that you just no longer love. At the end of the month, donate them. You can take them to a local consignment store, Goodwill, or donate to Minimized Closet. 3. We took care of the clothes that don’t fit, but don’t forget about the damaged clothing that’s taking up space in your closet as well! Some things may be easy to fix, but if you know that you don’t love it enough to take that time, let it go. 4. If you’re anything like my little sister, this one may be tough for you. It’s time to get rid of those lonely socks. You keep hoping their mates will appear, but they have been stuffed in the back of the drawer alone for too long. Keep track of those socks from now on by making sure that you put the pairs together as soon as you put laundry away. Leave no sock behind! If you do find stranglers on laundry day, choose a specific spot to leave them so you know just where to look when their match is found. 5. Technology is changing so quickly, that many of us are left with old versions or broken electronics that are no longer useful. Don’t let them collect in a junk drawer - get rid of them! If it’s just an older version or still has usable parts, you may want to set them aside to sell. If you can commit to it, go for it! Amazon will give you trade-in credit for most electronics, and you can also send them to a few other places for quick cash. 6. While we’re on the topic of technology, let’s step over to those cords & chargers that haven’t been used in years. We’ve all done it - keeping chargers around even though we no longer have the phone or camera to go with it! And does anyone need 6 pairs of Apple headphones? Probably not. 7. If you’re like me and love a good game night, you may also have a collection of games you no longer play or that have missing parts/pieces. It’s tempting to keep them - maybe you’ll want to reminisce and play again one day, or maybe you’ll finally find that missing piece! If you just no longer play them, donate! If you’re missing parts or pieces, trash it. Nobody wants to buy a game at the thrift store only to find pieces missing. Some may be nostalgic. That’s fine, as long as you actually watch them! Just don’t fall into the trap of collecting all of your favorite DVDs just to have them sit on a shelf and never leave their cases. 9. Sometimes expired medications collect because we’re not sure about the best way to get rid of them. Some medications can be thrown away without worry. If you’re unsure, you can check this guide. Want to drop them off somewhere? Find a place near you that collects medications to ensure safety. 10. Believe it or not, instruction manuals can now be found anywhere online. You don’t need those papers taking up space in your home! How often do you really go to look at those, anyways? Let’s toss them. 11. In order to stay decluttered, you’ve got to commit to no more unnecessary multiples. Multiples can accumulate from combining households or simply because you misplace something and accidentally buy another. Either way, there is no great reason for one home to have five measuring tapes or three coffee makers. 12. Have you ever gone to buy storage bins or baskets before planning where they would go? If you have containers that don’t serve a purpose, or a mis-matched collection that is driving you crazy, just let them go. The idea of them is great, but they may be causing more clutter instead of containing the clutter like you intended. One of the best pieces of advice I can give is to start organizing before you buy the bins. Know what you need before you buy! 13. Now that we’re almost done, it’s time to get serious. We’re going to throw out anything that gives you bad memories. It can be tough to let go, but your happiness is worth more than that sweater or silverware! Maybe it reminds you of a past relationship every time you put it on. It may bring you to a bad time of your life every time you open the drawer. Whatever it is, do yourself a wonderful favor, and get rid of it. Don't you already feel so much better? Decluttering and creating an organized home takes time - it's not going to happen in one sitting. But you just took an excellent step towards making your home a happier and more relaxing place. I'm giving you a mental high five (or a hug, whichever you need more)!